I’ll talk about what do care when choosing a radio transmitter, and at the end, recommend some models. To fly mini-drones, we need at least 5 channels: 4 for basic flight controls (Roll, Pitch, Yaw and Throttle), and a channel to arm and disarm the drone. Pro tip: It’s possible to fly with only 4 channels, but in mini-drones, this practice is strongly discouraged, because the arm and disarm commands will be a combination of sticks movements, and this type of command is slow and subject to failures. Besides the minimum is 5 channels, rarely more than 6 channels are used. Mini-drones are very simplified aircrafts, and hardly ever have lots of flight modes and adjustments that must be controlled in flight. So, the quantity of needed channels to control the aircraft is small. Usually the sixth channel is used to change the flight modes between ACRO, ANGLE and HORIZON. But even this is optional. Most pilots fly only in ACRO mode and do not have a switch to change to another mode. Long range, more than couple miles, is not a so important feature then we talk about racing drones. Usually we fly in close locations, rarely going beyond half mile of distance. But it’s important to have some room to fly without worries in case you need to go little further. Every manufacturer provides the range of the radio, so it’s important to observe that. Besides range, another characteristics that you should observe is the transmission protocol. Manufactures have different ways to deal with radio interference, and this means reliability. It’s always a good idea to understand how each protocol works to decide what will work better for you. In mini drones we have less room to accommodate components. It’s important to observe if the available receivers for the model of radio transmitter you plan to buy to know if they’ll fit on your drone. Remember: You’ll have to place antennas properly, so you need to check the size of the receiver antennas cables too. There are different receivers for same transmitter model. Some of them are created specifically for multirotors. You should look for receivers that are capable of serial communication with flight controller. The most common is SBUS, but there are others, like IBUS (FlySky) and Spektrum. All of them allow all channels passing through only one wire, witch is faster and more accurate. PPM protocol allow one-wire communication too, but it’s analogue, so it’s less precise and slower. If you can, avoid it. PWM communication is the most common way in traditional air models. It’s one wire per channel you need to control. Besides the latency is not a huge problem, it’s still slower than digital protocols, but the main problem of PWM is the big mess of wires you get to the flight controller. Some modern FCs don’t even support PWM input. So avoid PWM. Another interesting receiver feature is telemetry. Not all receivers support it, but the ones who support sends information to the transmitter, like battery situation and signal quality. Besides it’s not a mandatory feature, it’s cool. The transmitters also are different from each other and have unique characteristics. The ergonomic is very important. A transmitter that is bigger than your hands will be a problem. The weight, the gimbals (levers)… Everything changes your perception and affects the flight quality. Some transmitters have telemetry features (when model sends information back to the transmitter). For mini drones, only two information are important: The battery status and the signal quality (RSSI). You can set alarms on transmitter so it can warn you (by beeping of vibrating) when you battery is near to end or when the signal is weak and you’re about to lose communication with your aircraft. 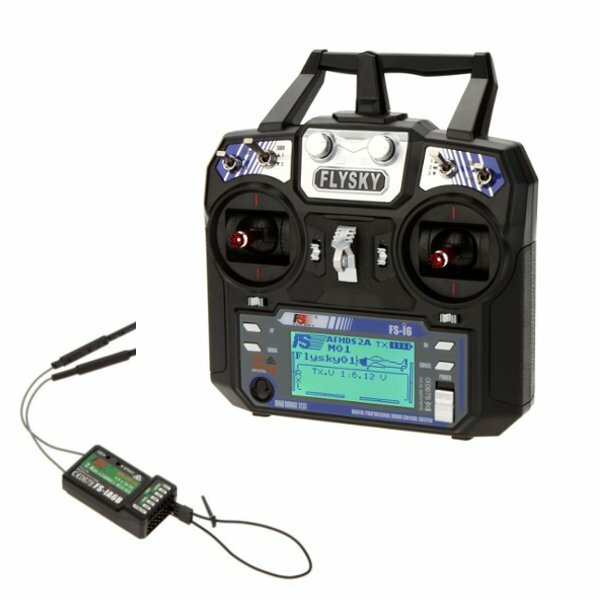 The FlySky i6 is a cost-effective option. It have 4 switches (one is a 3-stage switch) and 2 potentiometers. It’s a 6 channel transmitter, but it can have up to 10 channels after a simple firmware upgrade. If works with AFHDS 2A protocol, but it’s compatible with the early version AFHDS. In this new protocol, the receivers can send telemetry data and also work with IBUS digital serial protocol to communicate with flight controller. The good news: It’s dirt cheap, and comes with a FS-IA6B receiver in the box. It’s a good idea to buy the cable for firmware update. To buy, click here. The RadioLink AT9S is a cost-effective choice too. It’s more feature-rich, but costs little more too. It have more professional-look (doesn’t look like a toy like the FlySky i6). The gimbals allow a more precise tension adjustment. It have more switches and more programming options. The telemetry allow sound warnings and it have integrated flight timer. It can transmit up to 10 channels. 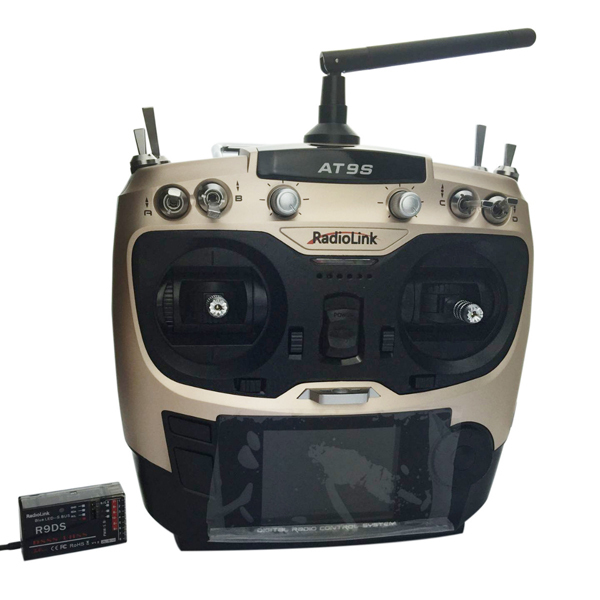 The receivers are not too expensive, and there are lots of options for every type of aircraft. It’s compatible with DSSS and FHSS protocols, have an external antenna and color display. One of the most feature-rich transmitters in these days. It have excellent cost-effectiveness ratio if compared with other high-end models like Futaba or Spektrum. One of the main advantages of this model is that it can have “modules” attached to it, that expands its capabilities. Without any module, it transmits on protocols ACCST, D8, D16 and LR12. But you can add a Spektrum module, and control aircrafts that have Spektrum receivers, or Futaba module to control Futaba receivers… There are modules from Orange, Assan, FlySky and lots of other manufactures. 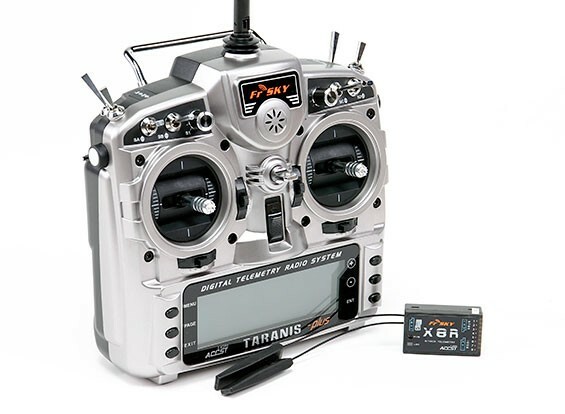 With a Taranis, you can control all of them. It’s capable to do “long-range” flight, and can log everything in a memory card. It have lots of mixers, alarms, voice feedback… There so many features that feels little “too much” for flying mini drones. You probably won’t use 50% of its features (unless you fly another types of aircraft). Next: Soft mount – So, what is it? Recentemetne joguei no lixo um taranis. Os produtos da frsky tem são problemáticos com realção a atualizações e programações, eu comprei um receptor de 6 canais com estabilização e um acessório para liga-lo ao computador para fazer os ajustes e depois de quase um ano tentando em 4 computadores diferentes desisti e joguei tudo fora. 9 entre 10 pilotos de miniquads usam FrSky. Os rádios da FrSky são constantemente atualizados com o que há de mais moderno. Um rádio da concorrência nunca recebe atualizações, para ter algo novo, você precisa comprar outro rádio (e pagar uma fortuna, é claro). Olá Daniel, muito bacana o post. Ganhei um Eachine E50 e, gostaria de saber se há como configurar algum controle para pilotar, aumentando assim o alcance da área de controle. Não, esse drone tem um receptor integrado que funciona apenas com ele. Muito boa as orientações, mas saberia me informar algum receptor para o Turnigy 9x versão 1 com protocolo ppm ou sbus?